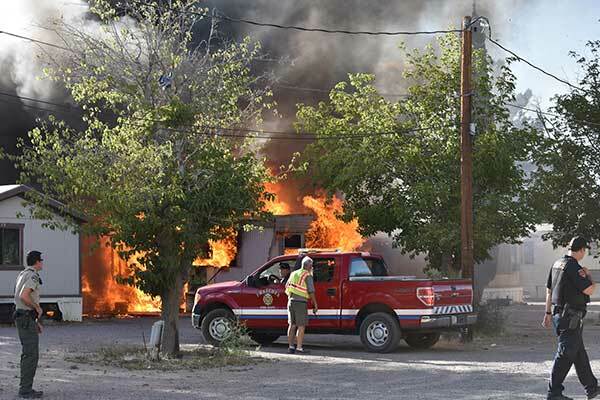 Thatcher – A fire consumed a mobile home at Red Lamp Mobile Home Park Thursday afternoon. 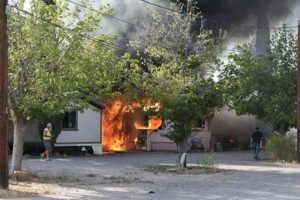 The fire broke out at approximately 5:30 and before fire fighters arrived on the scene the home was completely engulfed in flames. The fire spread to adjacent homes. 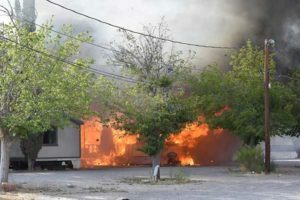 Graham County Electric Co-op turned off gas and electric lines to the mobile homes while fire crews battled through smoke and heat to keep the fire from spreading. Safford fire crews came in Friday morning to relieve Thatcher fire crews. A family of of five have been displaced because of the fire. The cause of the fire is under investigation.